Received some very nice CAD drawings from Hal Norrish in Vancouver and had them printed full size today. I think these are the only scale drawings of the Buffalo in existence and I am indeed lucky to have them. 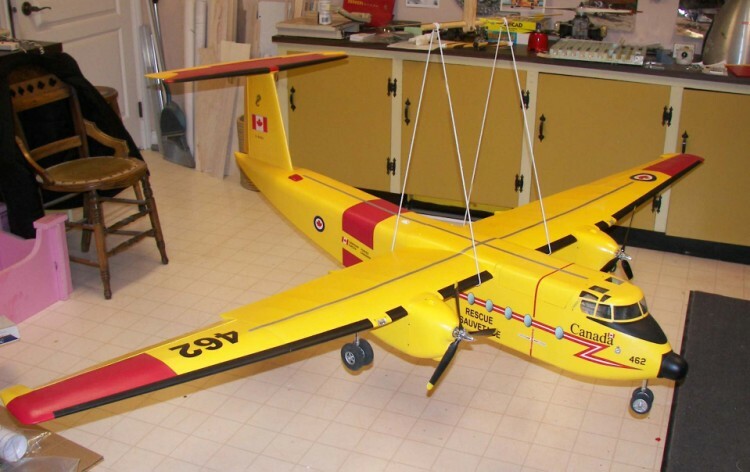 This will be a 1/12 scale model with a wingspan of 96"and will be very lightly built. I plan to use two brushless electric motors in it since the Mars was so successful. After the first week the fuse and wings are beginning to take shape.....quite standard construction, nothing revolutionary here. Here the nose is framed up ready for covering And here it is strip planked with 3/32" X 3/8" strips. That beautiful big DeHavilland T-Tail is starting to take shape. The controls are all completely hidden. The covering and paint has been added to the tailfeathers. The covering is Sig Coverall applied in the usual manner. The 1/16 balsa sheeting is first prepped with one coat of nitrate dope to seal the wood from moisture of the in the next coats.....otherwise it will warp. Two coats of clear water based urethane is then applied with a brush to fill the weave and permanently stick the cloth to the wood. Three coats of latex color is then airbrushed on. The final coat is a latex based clearcoat, either flat or semi-gloss depending on the look desired. The decals are made with the ink-jet printer onto waterslide decal paper. Now that I know the system works well I can begin covering the rest of the airplane. it will be the lightest way to cover with fabric that I have seen. I don't like film coverings on a scale model. All of the components are also inexpensive, non-toxic and can be fuel-proofed if necessary. Here the center wing panel and the forward battery hatch have been built and fitted to the fuse. The fuse is now ready for covering as described above. In this shot the fuse has been covered and painted.....the waterslide decals are being laid out and applied. It's starting to look like a C115. The paper racing stripe on the side of the fuse is just for a trial fit.....getting these graphics to correct scale is not easy and the decal paper is expensive so I like to do it on paper first to get the right size and finally print out the graphics on the decal paper as per the sheet standing against the fuse. Some very good photos were available on Airliners.net and I was able to trace the graphics off the photos and reproduce them directly onto the decal paper using the Photoshop program. 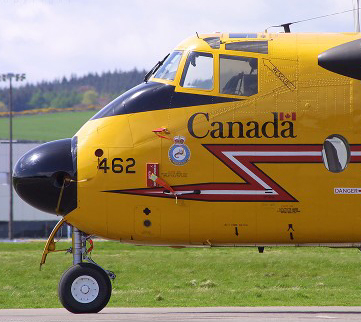 What a cool airplane.....I love DeHavilland. I did'nt like the way the cockpit windows were turning out so I cut off the entire wood framed canopy area and made up a balsa pattern for vacum forming a new one.....After vacum forming the new cowl I masked out the window areas with mylar paint-mask, sprayed on a coat of primer, the yellow coats and finally a coat of clear. The canopy is screwed in place and is removable. Here the strip planking on the engine nacells is started. The retractable landing gear will go in the nacells. With a little help from John at Harwood Composites I finally learned how to make a good plaster mould. The plug for the cowls is made of foam and lightply covered with a layer of glasscloth.....a lot of filling and sanding follows, and finally the mould wax. This time the plaster mould looks very good. I saw this cool flashlight keychain in Canada Tire and couldn't help but think what a nice landing light it would make.....just the right shape..... So I tore it all apart, saved only the essentials and wired it up for a rechargeable battery pack. It will fit into the wing easily and look good. A plastic cover will go in the front. Here are the finished wingtips complete with ailerons. 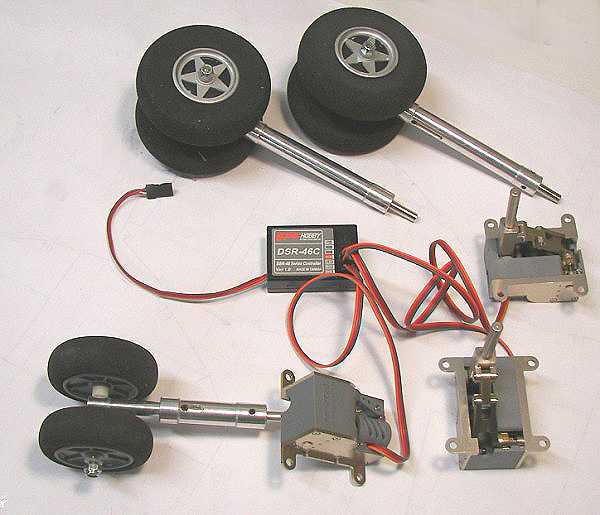 The wing servos are #555 thin wing servos from Hobby City.....they will have 57oz.in. of torque on 4.8v. They are very small and have metal gears, metal output shaft, metal control arm, double ball bearing and they are waterproof. .......not a bad deal at US $20.00 ea. 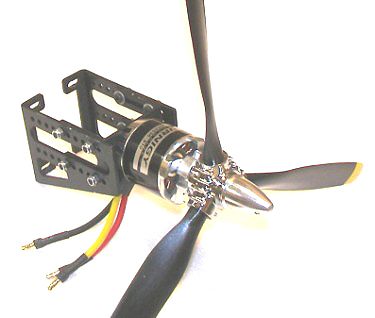 Motor & prop weight 7.5 oz. it is fully adjustable and very nice quality. Here is the electric retract set from EPF Hobby in Taiwan. The controller plugs into your receiver gear channel and the power is from the receiver battery (or a separate 6v. battery). It is fully electric with no servos or air supply to worry about. the travel is 90 degrees and the wheels move very slowly and realistically. The quality of the three retract units is excellent..... all machined metal construction. 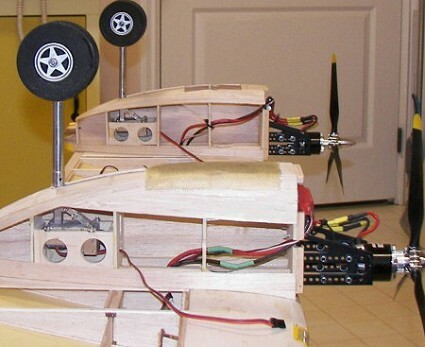 The nosewheel is steerable from the rudder servo. The operating units are very light and strong enough for an 8 to 10 lb. airplane. The supplied oleo legs were too small for the Buffalo so I purchased the larger oleos from RC Warbirds in Singapore. Here the retracts are installed in the nacells and seem to be working OK. Before cutting the nacell bottoms open I laid up a fibreglass sheet on the area where the gear doors will go. The glass sheets are the correct shape and will be cut to size for the gear doors. Nearly finished, here it hangs in the C/G machine. It will fly after I figure out the C/G and test-run the motors. AUW came out at 8lbs. 6oz. which makes me happy.....not bad for a 96" model.